The global market for pacemaker devices is expected to witness significant growth owing to the increasing expansion of medical equipment industry. The growth has also been increasing due to the advancements in cardiac treatment devices made by governing authorities. With the frequent mishaps in cardiovascular conditions especially in Western Economies, is anticipated to grow the pacemaker devices market steadily in the forecast period. Many companies have also started to focus on business expansion and innovation so as to persist intense competition over emerging markets. 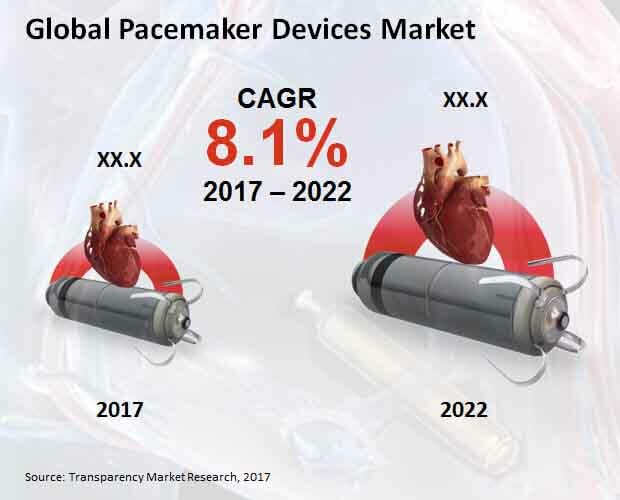 The technological innovations have made the use of pacemakers more convenient and this has resulted in enhancing the growth of global pacemaker devices market throughout the forecast period. According to the report published by TMR, the pacemaker devices market was valued at US$5.5 billion in the year 2017 and is anticipated to be worth US$8.1 billion by the end of 2022. The global market exhibits a robust CAGR of 8.1% in the forecast period 2017-2022. According to product, the pacemaker devices market is bifurcated into implantable and external pacemaker. Among these, implantable pacemaker is expected to lead the market from 2017 to 2022 as it covered over 65% of the overall market in the year 2017. The continuous development in product innovation and increasing demand for advanced pacemaker devices is responsible for the growth of implantable pacemaker devices segment. In addition to this, implantable pacemaker devices are more accurate in readings and convenient for patients than external ones, thus enabling it to be the most preferred segment throughout the forecast period. According to end-use, the global pacemaker devices market is divided into cardiac clinics, hospitals, and ambulant surgical centers. The hospitals are witnessing an increase in the number of patients which is expected to make hospitals the leading end-user of pacemaker devices market. This is coupled with the need for surgical procedures and physical assessment before grafting the pacemaker. As per regions, the global market for pacemaker devices is spread over Asia Pacific, North America, Europe, and Middle East & Africa. North America, as per revenue generation dominated the market globally. In the year 2017, the market in North America earned a revenue of US$1921.6 million. This is expected to increase to US$2917.9 million by the end of 2022. The overall pacemaker devices market in North America is likely to highlight a CAGR of 8.7% during the forecast period. Owing to rising growth of these devices in this region, together with existence of various medical organizations and global key players, North America is holding a strong growth in the market for pacemaker devices. Europe as well has been a main contributor in the pacemaker devices market. This region is expected to cover around 25% of the market share in the forecast period. Also, Asia Pacific excluding Japan is anticipated to lead the regional pacemaker devices market in the years to come. The main reason for the growth in this region is due to the increasing cardiac arrests. The Asia pacific market except Japan is estimated to grow at a value worth US$1692.2 million by the end of 2022. The region is likely to exhibit a CAGR of 8.3% from 2017-2022. The global market for pacemaker devices is established with the presence of numerous medical companies. The market is estimated to be more intense in competition as the number of specialist leaders have increased in the global market. Few of the prominent leaders operating in the pacemaker devices market globally include Medtronic Plc., Lepu Medical Technology, Pacetronix Limited, Abbott Laboratories, Zoll Medical Corpo, Boston Scientific Corp., Biotronik SE & Co. KG, OSYPKA AG, and Oscor Inc. among others. Today, the healthcare industry is moving toward a client situated condition to offer quick, dependable, and savvy symptomatic services to the patients. Additionally, with the developing concerns relating to the accessibility of quality medicinal services governments all over the globe are executing activities to offer positive treatment choices. In the medical industry, pacemakers assume a vital part in tending to concerns relating to treating perilous cardiovascular infections. To viably counter cardiovascular conditions and go on keeping pace with the rising requirement for cardiovascular equipment, key producers in the medicinal gadgets arena are confronting the surging demand from the consumers. With the assistance of client division services, organizations in the cardiovascular pacemaker space can profile the potential clients and concentrate their showcasing endeavors on a wide scope of clients. Also, in the cardiovascular pacemaker devices market, organizations can comprehend clients' spending habits and devise a demographically strategic business plan. The report offers a distinctive evaluation of the global pacemaker devices market, taking into account its growth factors, restraints, and potential business prospects. According to the insights of the World Health Organization, number of deaths due to CVDs were roughly 31.0%, of the 17.5 million deaths occurred in the years 2012. Among the 17.5 million, around 40.0% and 38.0% deaths occurred on account of coronary illness and stroke, individually. The high frequency and death rates related with cardiovascular conditions are driving the demand of the simulated heart rate management gadgets. Surging population and emerging economies in the Asian countries like India and China are expected to make offer bountiful opportunity for the worldwide pacemakers market. Additionally, advancement of new agreeable products would create significant open doors for the worldwide market for pacemaker. A part of the current patterns in the worldwide pacemakers’ market incorporate organizations engaged with innovative research and development work for more innovative products. Geographically, North America is expected to continue holding dominance in the regional market bifurcation, followed closely by Europe. Developed healthcare infrastructure, presence of planned reimbursement structure, greater per capita healthcare spending, and higher awareness among the population about advanced technologies supported the significant growth of this regional segment. Moreover, Asia Pacific is anticipated to exhibit healthy growth over the coming years. Several economic government initiatives are anticipated to create a free and open economy. For instance, implementation of Goods and Services Tax (GST) in India to avoid the tax cascading effect is anticipated to bring down the tax rate, thus improving the ease of doing business in the country. Also, recently introduced economic reforms in China, promoting a well-balanced and open economy, has had a significant impact in shaping the global economy in 2016, thus presenting more investment opportunities for multinational players in this region. With a moderately fragmented vendor landscape, the global pacemaker devices market is anticipated to become highly competitive in the coming years and is expected to witness new entrants as well. Key player operating in the market are Zoll Medical Corporation, Biotronik SE & Co. KG, Medtronic Plc., Boston Scientific Corporation, Abbott Laboratories, Lepu Medical Technology, Oscor Inc., Pacetronix Limited and OSYPKA AG.